Scientists at the British Halley station - here in Dronning Maud Land - discovered the ozone hole in 1985. More precisely, what they discovered was a severe drop in stratospheric concentrations of ozone in the antarctic spring. Further research revealed the likely mechanisms involved - in the cold antarctic winter so-called "polar stratospheric clouds" form. These clouds often look eerily reddish/blue in colour at dawn and dusk, and are familiar to most norwegians by appearance if not by name. They are packed with tiny, crisp ice crystals. These ice crystals act as catalysts and surface for the chemical reactions breaking down ozone in the upper atmosphere. Three factors then combine to cause the formation of the ozone hole in springtime. 1. Massive anthropogenic release of CFC's and halocarbons into the atmosphere. CFC's last for ca 100 years. Although a huge victory for international environmentalism back in 1989, the Montreal protocol was too late. 2. The formation of the Polar Vortex (told you!). This is a permanent anticyclone around Antarctica, formed by air spiralling around the polar high pressure cell caused by supercold and dense air. The Vortex basically shuts down the continent for incoming ozone and warmer air. 3. Sunlight. The reactions breaking down ozone require UV-radiation. When the sun returns in springtime, the ozone-eaters awake from their stratospheric slumber. After this breakthrough discovery, ozone monitoring specifically, and air surveillance in general, has been a significant part of Antarctic research. 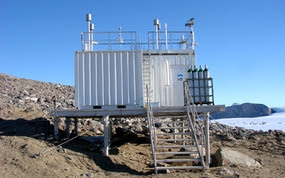 At Troll we have a small monitoring station run by the Norwegian Institute for Air research (NILU). As I find it much easier to get to grips with birds and fuel drums than atmospheric chemistry and radiometers, I asked Chris Lunder, our resident NILU scientist, to show me around the compund. The gas containers outside feed the different monitors and intruments inside. Lots of contraptions with funny names growing out of the roof. Chris patiently trying to explain the mysteries of the "PFR Sun Photometer". It indirectly measures the amount of aerosols (particles and droplets) in the atmosphere. Other instruments sample and filter the air directly, to say more about the composition of the aerosols. This is important, because understanding particles in the athmosphere means understanding cloud formation and cooling effects, and understanding those means better and more accurate climate models, which again means less ammo for politicians using every minor scientific uncertainty as an excuse for doing nothing about the major certainties. There's something alluring about instruments that look like they were built in a garage. Air intakes and outflows everywhere, calibration solutions, mp3's. Chris' speciality is inventing, tinkering with, and maintaining these gadgets. They measure carbon monoxide, soot, surface ozone, mercury, PCB's, UV-light, and a battery of organic and inorganic pollutants. This is not a new line of Robotniks - but an ongoing experiment in cheap collection of pollutants. The Collectors sit there patiently, without any active air intake or gas flows, waiting for particles to get blown into the bowl where they might get stuck and eaten. The digesting filters will provide hours of analytic fun for Chris and his colleagues when back at the lab in Norway. Last week was the busiest yet here at Troll - as we were expecting a Very Important Person, accompanied by 40(!) not-so-Important Persons, for a weekend visit. VIP: The norwegian prime minister, Jens Stoltenberg. NSIP: state secretaries, media consultants, journalists and photographers from Norway, Germany and the UK, a satelite company director, aircraft crew, and central leaders and scientists from the Norwegian Polar Institute. Preparations included pitching 16 tents, clearing away our rubbish heap by squeezing it into containers with heavy machinery, pressing 200 empty fuel drums, some medical emergency preparations at the airport, discovering tables and chairs we didn't know we had in the first place, forcing our cooks to work overtime, opening a new outdoor urinal, and strenously raising a red mast to have visible proof we've been doing something this summer. Even anti-monarchists like me feel a patriot tingling when seeing the words "Royal" and "Norwegian" together like this. Maybe I was just loosing sensation in my hands due to the cold. Unloading the sleeping bags. Our prime minister, a fairly down-to-earth guy, preferred to sleep in a tent like the other guests, and by so doing, (unknowingly) prevented an outbreak of in-station fighting over who was going to give up his bedroom. This is our man - up the mountainside behind Troll, naming 3 new mountain tops, and expressing honest enthusiasm over being this far south. Jens Stoltenberg heads a centre/left coalition government and leads the norwegian Labour Party. He just came back from the Bali climate negotiations, where he got some attention for being more concerned than the others on behalf of the climate. When returning to Norway he slightly changed the government policy on carbon emissions, amongst other things increasing subsidies for alternative energy research, and by so doing brought Norway's climate policies a couple of centimeters forward. Our massive oil industry was left untouched, of course. By normal political standards, this was of course a very radical step. He is the first norwegian prime minister to visit Antarctica, and the timing is no coincidence, with anthropogenic climate change currently high on the international agenda - and Norway playing an important role in polar climate research. In his speeches at Troll he also drew the line back to the norwegian explorers of old, Amundsen etc, and our proud "historical" responsibility for Antarctica and everything Polar. Again, difficult to separate patriotic tingling from normal bodily sensations - this time a slightly nauseous feeling. Our cooks preparing a grand dinner with both Norwegian and South African fish. 6 of us were serving the guests - quite enjoyable since none of us know much about (table) etiquette, 2 months in isolation not helping in that respect. One evening happily sloughing around in our woolen underwear, the next serving the prime minister. Antarctica is a place of contrasts. The next day we took the whole group sightseeing around the Jutulsessen area. T4S piste basher with sled served as tourist bus. Here we are exploring a wind-hole under the 900m high vertical wall called Jutulhogget ("The stroke of the giant"). After the breakup, mountains resembling Jutulsessen in rocks and composition eventually ended up in present-day Mozambique, Madagascar and India. The science director of the Norwegian Polar institute, Kim Holmén, talking about glaciology, geology, climate research, birds, and the upcoming lunch stop with hot dogs and coffee. Stoltenberg also opened a new satelite station, "TrollSat", on top of our neighbouring hill Nonshøgda. Together with "SvalSat" on Spitsbergen in the Arctic, these two satelite receivers can download data from polar orbit satelites twice per circuit instead of once. Polar orbit satelites are especially important for research purposes, an example being CryoSat 2, monitoring the global ice caps. TrollSat will furthermore contribute to the Galileo Navigation System, a EU and ESA funded contendor to the American Global Positioning System (GPS). The main difference between Galileo and GPS is that Galileo is independent of U.S. military interests and will be available at full precision to all users, both civil and military. Costing 3 billion euros, it's also a big prestige project for the European Union. Before leaving, we set up a video conference between Stoltenberg and the director of NPI, Jan-Gunnar Winter, who is currently at the South Pole station, having just finished the norwegian-american IPY traverse. The expedition has been cursed with mechanical problems, and actually had to leave behind their vehicles at an improvised winter base short of the Pole, Camp Winter(!). Even still, they have successfully collected and flown out all the scientific material (5 tons of ice core and snow samples) they had planned for. The vehicles will be digged out of the snow next summer season, and after a serious overhaul hopefully bring the expedition back to Troll, along a different plateau route. Even without limos, experienced waiters, or other statemanly pleasures, they were all very excited and happy after the visit, including Big Man himself. On a less cynical note - I have to admit this kind of V.I.P. visit is important. We need all the PR we can get for polar research, and PM's undoubtedly bring PR (they also sit on the money bag). Understanding the poles, especially the dynamic of big ice sheets, and their relation to sea level and ocean currents, is vital to climate modeling, and has not been taken properly into consideration by the Intergovernmental Panel on Climate Change (IPCC). The IPCC estimates a 60cm sea level rise in the next 100 years, due to global warming. If the Antarctic ice sheet looses a meagre 1% of its mass, it would at least double this estimate. If the West Antarctic ice sheet melts, world sea levels would rise 4-6 meters. Four of us decided to start the new year with a 2 day leisure expedition to Svarthamaren, the bird colony nunatak about 100km east from here. Luckily the decision was made some days earlier, well before the after effects of our new year's party dawned on us. We struggled out of bed to pack the snowmobiles and left by 2am. Next to Svarthamaren ("black hammer") lies the small unmanned research station "Tor" (named after the hammer-wielding thunder god). The ornithologists have wrapped up most of their research there, so the station serves as a "holiday cabin" and getaway for the staff at Troll. Small sleds were loaded with kerosene, mountaneering and safety gear (in case of falling into crevasses along the way), freeze-dried food, primus, and a tent. I'm riding an old "Polaris" skidoo. A noisy but reliable 2 cylinder engine. Working: the starter and the gas. Not working: speedometer, windshield, brakes. The journey took 3,5 hours, luckily in nice sunny weather, across "Slithallet" and "Hellehallet" glaciers. Along the way we passed the prominent "Hoggestabben", resembling a tree corpse. As we got closer to "land", we discovered clouds of petrels overhead. They were riding thermals, some of them going 300km out to the pack ice to feed - others gliding down towards their breeding colony in the cliffs near Svarthamaren, crops full of semi-digested krill and fish oil. The cliff appears silvery white due to milenniae of bird droppings (=guano). The actual nests are in the scree zone beneath the cliff edges, where the birds find lots of suitable nesting places amongst boulders and gravel. The main inhabitant by far is the antarctic petrel. They are bigger than the snow petrels, and prefer nesting in the (relative) safety of big colonies, not unlike seagulls, auks and puffins up in the arctic - the main difference being that the colony lies on a peak surrounded by ice instead of the ocean. The snow petrels are more scattered nesters - being less social and preferring to hide underneath the big stones to avoid predation. The antarctic petrels are rising on the ridge wind, barely flapping their wings, then dropping down to their waiting partners on the nest below. Some of the females have eggs now, and depend on their partners for both food and guarding. Approaching Tor station. Behind and above the building the talus zone hosting the petrel colony. The lower reaches are till-covered, more exposed, and serve as nesting ground for the skuas. They are the only predators here. If mammals were somehow introduced here, as has sadly happened on so many southern ocean islands, it would surely wreak havoc in the bird colony. No rats seen yet, though. Dogs (and all other introduced animals) have been banned from the Antarctic since 1998. The station is a simply a stilted container and a glass fibre igloo. There's food supplies, a stove for melting water and cooking, a paraffine stove for heating, 4 beds, and lots of chocolate. The bird colony stretching out in the background. The hobby ornithologist crew, enjoying their Drytec and coffee. Clockwise from top right: Steinar (shelf transport crew) , Harald (satelite antennae constructor), Geir (all-round technician), and me. After our meal we went out to explore the immediate surroundings. Svarthamaren is a so called "ASPA", meaning Antarctic Specially Protected Area - a kind of "nature reserve", as defined by the the 1998 Madrid Protocol, the excellent new addition to the effective but loose Antarcic Treaty system. Sadly, this also means our movement around here is severely restricted. This picture shows us trying to get good close-up shots of the neighbouring south polar skuas. They were very aggressive, and charged towards us to chase us off (their nests were not far away). The skuas are able to stay at Svarthamaren the whole summer, living off eggs, dead and living petrels, sometimes grabbing and killing petrels who stray from the colony. The hassle and unpredictability of scavenging is offset by not having to fly 300km to feed every other day. The next day we took the snowmobiles out to explore of the surrounding valley. First we drove towards the big glacier fall coming straight down from the polar plateau. The peak on the right is "Svarthamaren" itself. I suspect the name "black hammer" comes from the massive black dyke (gabbro?) cutting across the reddish (granulitic?) bedrock. Further north, we're standing on a small nunatak, looking towards "Cumulus Mountain" in the distance. Along the cliff a wind-hole had formed as the air has been forced up and over the cliff, releasing its load of snow before reaching it. On the sunny side of the cliff we found several meltwater pools, nurturing spongelike beds of lichen. And with that celebration of life, again persevering against all odds - I wish you all a happy, and eventful, new year!